At Thoroughbred Adoption Network, potential adopters frequently ask us: Why are adoption applications contacts so cumbersome? Potential adopters (and even some involved in thoroughbred aftercare) ponder if it is worthwhile to screen adopters so thoroughly. Adopters argue that every horse that’s rehomed allows for another to be rescued, so it should be easy for have a horse transferred to their care. The number of horses returned from adoption may be discussed among individual organization staff and boards, but in 2013 Standardbred Retirement Foundation highlighted the issue in an article published in the USTA website. According to the Standardbred Retirement Foundation, “Twenty-four years of statistics compiled by a horse adoption organization show that 76 percent of horses adopted for the first time need another adoption, and 49 percent need more than two homes in their lifetime.” There is no reason to believe that those statistics are any better for any other breed. 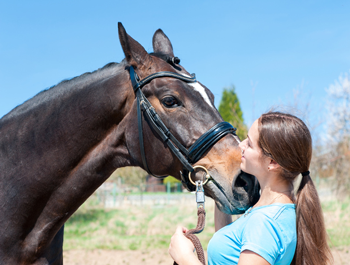 Usually, horses are often returned from adoption for valid reasons – divorce, loss of employment, etc. But what happens when an adopter transfers ownership without notifying the rescue program, or when the horse is sold for a few hundred dollars? Sometimes adopters feel that after a certain length of time, they own the horse and can make that decision. Having a rescued or retired horse finding its way back to a meat auction or any other dangerous situation is something that even the most well-funded organizations fear, and many have had that unfortunate experience. Not only is this detrimental to the horse, but often there is bad publicity from the event, particularly on social media and this can result in a black eye on the organization impacting fundraising efforts on which they rely to exist. Simply put, there is a lot riding on the quality and integrity of the person that filling out the application. We ask potential adopters to keep these things in mind when they are downloading a long application. Organizations are doing the best they can to protect the horses for which they’ve promised to care.